We are Effingham Presbyterian Church, a congregation actively engaged in living the abundant life - a life transformed by the love of God as seen in Christ Jesus, guided by the truth found in the Holy Scriptures and dedicated to the service of others. We invite you to join us at EPC for worship, for fellowship, for life! For Worship - Worship services begin each Sunday at 11am in our sanctuary. We enjoy a traditional service with music styles that range from classic hymns to gospel to folk to contemporary Christian. Sermons are Bible-based, examining specific passages of Scripture and what they have to say about our lives. Dress ranges from blue jeans to coat and tie. A nursery and children's church are provided. Sunday School precedes worship and starts at 10am. For Fellowship - At EPC, we love to get together! We gather every Sunday morning, but we also get together on Sunday evenings (choir practice and youth activities) and Wednesday evenings (fellowship suppers and Bible study). There are three women's circle groups that meet regularly and a monthly meeting for twenty-somethings. During the months that include a fifth Sunday, we get together for pizza and bowling. Everyone is invited - there are no age limits on food and fun! For Life - Christ not only promises His followers abundant life, He promises them eternal life as well. Through His death and resurrection, Christ offers us communion with God now and forever. If you would like to learn more about the Christian life, visit or simply contact us at Effingham Presbyterian Church. On June 17, 1906, a small group of believers formed Effingham Presbyterian Church in a farming communtiy just south of Florence, SC. The church had its beginning a few years earlier, however, in the Tans Bay School in the McLaughlin Community. A teacher at Tans Bay, Miss Kate McKenzie, conducted a Sunday School in the school house. Reverend Charles P. Coble, the paster of nearby Hopewell Presbyterian Church, joined Miss McKenzie's missionary efforts by preaching at the school one or two afternoons a month. The new mission soon moved its meeting place to the Effingham School where Rev. Coble began to conduct regular services. Long interested in establishing a church in Effingham, Mrs. J.S. 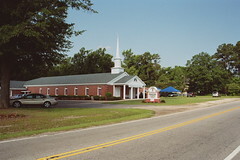 McCall, Effingham resident and member of the Florence First (Presbyterian) Church, recognized the mission's potential. It was largely through her help and influence that the necessary steps were taken to organize the mission into a church. Upon Rev. Coble's presentation of a 26-name petition to the Pee Dee Presbytery, a commision was formed to perfect church organization. The commission met on June 17, 1906, and, after a sermon by Rev. Mr. Clark, the new church to be known as Effingham Presyterian welcomed its founding members: Mrs. J.S. McCall, Miss Emma McCall, Miss Annie McCall, Furman Allen, Mrs. Furman Allen, W.M. Allen, Miss Effie Allen, J.T. Endy, Mrs. Ella McPherson, B.P Hatchell, A.R. McLaughlin, Mrs. A.R. McLaughlin, J.A. McLaughlin, Miss Jennie McLaughlin, J.N. Turner, Mrs. B.H. Turner and Ellie Turner. ©2008 Effingham Presbyterian Church (Associate Reformed). All Rights Reserved.